Connection to history and the character of a place make architecture meaningful. 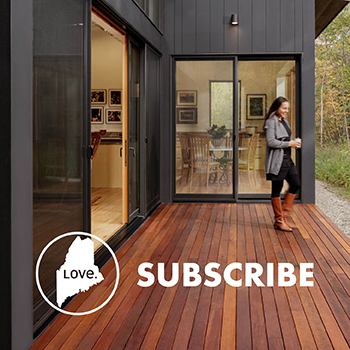 According to Pamela Hawkes of Scattergood Design, architectural metaphors are never literal and rarely obvious. Instead, architects prefer more abstract design references that are timeless and create lasting connections to the meaning of a place and the people who live there. “Unlike theme parks that impress at the start, she says, “we hope that users will discover new aspects and layers each time they visit.” This kind of design stimulates creativity in the initial phases, as architects handle the more concrete issues of client and community needs. And they ensure a deeper meaning in the architecture for its users. MH+D asked Hawkes to tell us more. Q. Why do architects steer clear of literal metaphors in their design? A. Metaphors are just one layer of any design, interwoven with the function, form, and organization of spaces. The kinds of more obvious “theming” that you find at chain restaurants or Disneyworld presents the user with just one take on “Fantasy” or “Wild West” and often grows trite or stale with repeat visits. Abstract references, by contrast, allow users to participate in the design dialogue, creating their own connections and stories. We think that makes the design more meaningful, more timeless, and more appropriate, especially for public buildings. Q. What are some examples of abstract references in your work? A. The long white beaches and amusement parks of Old Orchard Beach offered irresistible imagery for my partner, Scott Teas, as he designed the expansion of the Edith Belle Libby Library, completed in the spring of 2015. The gently arched roof of the new wing echoes the curling waves along the town’s shoreline, as well as the exuberance of the roller coaster and amusement rides at iconic Palace Playland nearby. Within the building, the semicircular circulation desk, topped with a concrete counter embedded with sea glass, reminds patrons of treasures hidden in the sand. A sunken storytelling area in the Children’s Room is surrounded by segmented walls of glass, which evoke sandcastles and invite children to linger there and find new worlds through books. The restoration and expansion of the Patten Free Library, completed in 1998, marked the first collaboration between Scott, as principal with TFH Architects, and me, as principal with Ann Beha Architects at the time. The charge was to triple the library’s capacity while only doubling its size and maintaining its singular presence in the town park. A single long pathway connects the worlds of the 1887 reading room and the new children’s storytelling area, creating a spine that organizes all activities and allows staff to supervise and assist patrons easily. The fan-shaped arrangement of the nonfiction stacks springs from that axis to provide intuitive wayfinding, views to the Kennebec River, and a symbolic connection to the curving lines of the sailing ships that have been launched in Bath’s shipyards for centuries. 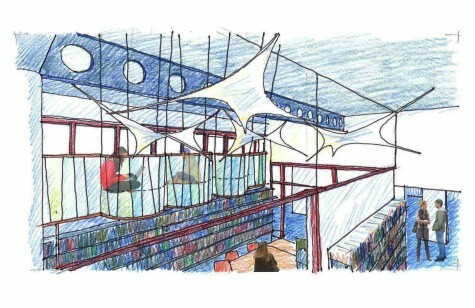 Scattergood Design is currently creating a “Teen Area” at the south end of the curved stacks area of the Patten Free Library. For teens poised on the edge of adulthood, this will be a safe place to discover the world beyond Bath and shape their future roles within it. Thus, voyaging was a natural theme, as well as another link to local heritage. To minimize impact on existing program areas and maximize flexibility for teen activities, our design suspends a catwalk from the ceiling to capture one slice of the upper regions of the 17-foot-high space. Images of literal crow’s nests—a sheltered spot for fledgling birds—and 19th-century nautical crow’s nests—where navigators could glimpse the far horizon—inspired a unique solution for the Teen Area. Three semicircular “crow’s nests” will provide new views to downtown and the river through existing clerestory windows. Enclosed in translucent multicolored plastic sheets with hoops of stainless steel, they will allow teens to study alone or in pairs apart from the main activity below. Q. What have you learned about library design, specifically, that informs your other work? A. Libraries are incredibly rewarding buildings. They serve as community “living rooms,” the one place where everyone is welcome to spend the day, regardless of age, income, religion, or education level. The best libraries offer a range of spaces to accommodate everything from quiet reading to lively collaborative learning— and remain flexible to incorporate future changes. Welcoming, flexible, timeless— the strategies that we have developed in our library designs certainly resonate in other work.